From time immemorial, our ancestors lived near Onondaga Lake. The Lake, its waters, plants, fish, shore birds, and animals are an intrinsic part of our existence. Long ago, the Peacemaker brought together the five Nations on the shores of Onondaga Lake to bury the weapons of war and form our government. The Grand Council of the Haudenosaunee Confederacy meets at Onondaga. The Lake is the living sum of everything in its watershed: the fish, the people, the plants, the soils, the tributaries. 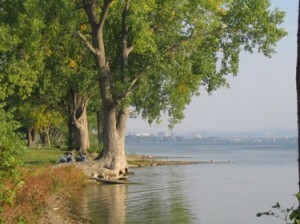 Onondaga Lake provides water which should be safe for drinking. Fish and birds make their home in and around the Lake. Food and medicinal plants grow along the shores of the Lake. The Lake was a place for people to fish and hunt. It was a place for children to play and swim and learn. Delegations would arrive at Onondaga for Confederacy meetings by traveling along the Seneca River to Onondaga Lake. We are carrying out our responsibility to the Lake. We take our children and grandchildren to important places around the Lake and teach them the proper names and stories for them. We have our own name for the Lake, one which conveys the respect and sacredness of the place and the proper relationship with it. Someday we hope to share this knowledge with our neighbors. The Onondaga Nation is thankful for the fish and their presence in Onondaga Lake. Onondaga Lake has always been their home, and we know that native fish have been absent from the Lake. Fish provide food for people, for birds, and for other fish and animals in the Lake. Migratory fish connect the waters of Onondaga Lake to its tributaries, and to the Seneca River and the Great Lakes. Fish use and live in the sediments of the Lake and with the large and small invertebrates form communities with the plants that transform the Lake environment. The Onondaga Nation is thankful for the plants around Onondaga Lake, which are still performing their duties. Plants provide food and medicine for the people. Different plant communities provide habitat around and in the Lake: water plants, wetlands, emergent wetlands, trees and shrubs. We will work to be sure that the native plants of the area will be found around the Lake. In order to heal the Lake, the species that originally existed in symbiosis with the Lake must be restored. We will restore the relationship between people and plants, so that medicinal plants can be honored and used and will thrive. We will honor the changing climate in restoring the Lake so that native species and varieties that have thrived in slightly warmer climates will be present, and we will manage invasive species responsibly. The conditions of Onondaga lake have been the best in years. Its still not good enough for the Onondaga Nation. For them it must be drinkable,all the native species returned, and you can eat fish out of the lake without precautions.